Just when you think enchantress Elle Chambers—a witch and insurance claims investigator—is on the road to happiness, powerful forces conspire against her and threaten everything she holds dear. In a tantalizing tale of twists and turns, the second book in The Witch Detectives series will keep you guessing right up to the end of this delightful paranormal romance thriller set in Edinburgh, Scotland. Will Elle stop running from who she truly is and learn to better use her enchantress powers? 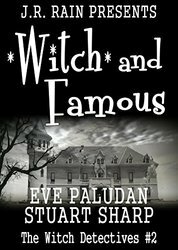 What dark secrets is the wealthy enchanter Niall Sampson keeping from Elle, and which witch can she truly trust? When Elle makes a trip Underneath—to the goblin realm—the past rears its ugly head and she faces the ultimate sacrifice in the name of true love!